Client service of the highest quality is Art Donato's guiding value in the representation of persons accused of serious crimes. Because of the complexity and expense of many of his criminal defense strategies, he wants to make sure that you're confident in his advice and approach. He can only earn that confidence by keeping clients fully informed, returning your calls promptly, answering questions, and presenting options in understandable terms. Mr. Donato always works closely with clients to make sure they are comfortable and well informed. To learn more about Mr. Donato's criminal defense practice, contact him at his Media, Pennsylvania office. Once you engage Art Donato, he immediately begins preparing your case, especially if you retain him while state or federal investigations or grand jury proceedings are still pending. The period prior to indictment, while the investigation is still open, is the most opportune time to retain an experienced criminal defense lawyer. An experienced criminal defense lawyer can take the necessary steps in order to attempt to improve your position and minimize the embarrassment or inconvenience of your situation. He can pursue a private investigation on your behalf which can develop facts favorable to the defense. In all cases, he attempts to achieve a favorable and acceptable pretial resolution/ All the while, he'll be working with experts to make sure that if trial is necessary, you'll be in a position to be thoroughly prepared. Martindale-Hubbell has given criminal defense attorney Arthur Donato its AV* rating. Additionally, he has served on the Criminal Procedural Rules Committee of the Pennsylvania Supreme Court, and he has provided testimony before Pennsylvania legislative committees on many criminal justice issues. 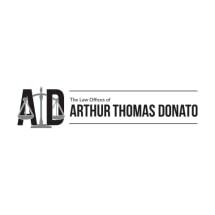 For additional information about the full range of his client services in your situation, contact the Law Offices of Arthur T. Donato, Jr., in Media, Pennsylvania. Listed in "The Best Lawyers in America"
This Was Justice for All?